Corporate coffee giants have found a welcome home in South Korea, but design-forward, independent cafés and locally roasted coffee are popping up all along the peninsula. 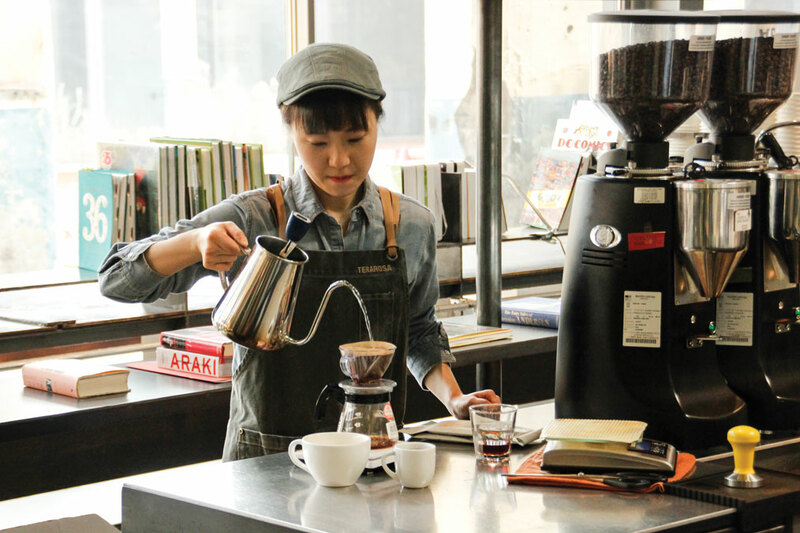 Savvy baristas are at the forefront of Korea’s growing coffee scene, answering demand from trend-loving Koreans seeking the best coffee has to offer. It’s a calm and quiet Saturday morning in Seoul’s Itaewon neighborhood. Wrapped in long woolen coats, weekend shoppers stroll casually down the street of this international district, a reputation that grew around South Korea’s largest US military base. The Korean barbecue and foreigner-centered bars are shuttered at this hour, but the door to 5 Extracts is open, a café where one of Korea’s best-known baristas, Hyun-sun Choi, makes coffee.White walls and minimal furniture lend an urban energy to the café. The interior is bright and modern; behind a yellow counter is a science lab of stainless steel and glass, all devoted to the perfect cup of coffee. 5 Extracts is not the only café around, not by a long shot. On my short walk from the subway I counted two others, and now that I’m here I see a Starbucks Reserve right across the road. But Choi is confident in his skills, which have been tried and tested at both international and Korean competitions. Choi was confident enough to open 5 Extracts with Starbucks nearby, a bold move that characterizes the growing demand for specialty coffee on the Korean peninsula. “There weren’t always this many roasteries in Korea,” Choi says, reflecting on his early days as a barista. Until a few years ago, ordering pour-over coffee from most Korean cafés would have earned you a blank stare. But the success of cafés like Choi’s is changing the local coffee culture, driving demand from trend-loving Koreans who want the best in gourmet coffee. While Choi brews me a cup of Colombian coffee, I check out the hardware on the counter: 2011 World Barista Championship, seventh place. 2010 Korean Barista Championship, first place. While it’s good for Choi’s business to display his awards, he’s shy to talk about them. But he agrees that awards like this have helped put Korean baristas on the map, remembering not so long ago when coffee knowledge on the Korean peninsula was confined to corporate chains and instant offerings. 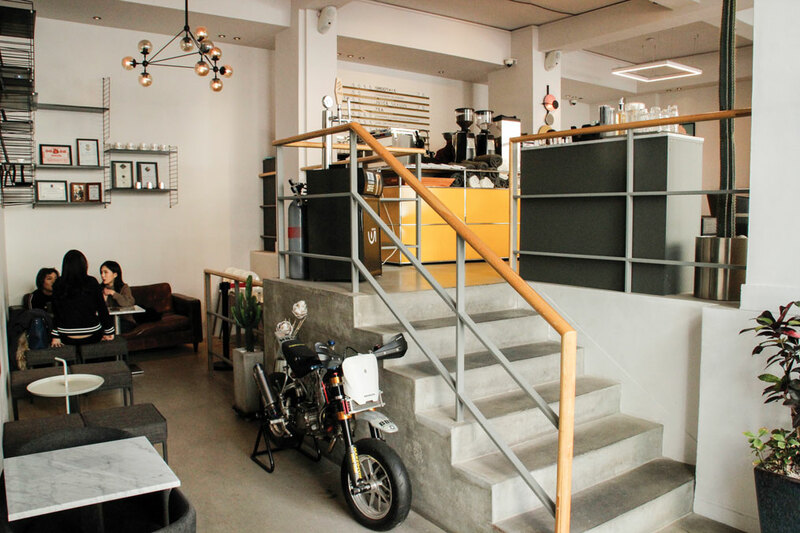 A bright-yellow bar is central to the Itaewon cafés airy, modern feel. And a surge in cafés to back it up. The number of coffeehouses in Korea grew six-fold between 2006 and 2011. By 2015, there were over 17,000 cafés in Seoul alone, putting the city ahead of US coffee hubs like San Francisco and Seattle in cafés per capita. Like most Korean baristas who got into the business before the coffee wave, Choi’s interest started abroad. He attended both high school and university in Melbourne, Australia, where he spent a lot of time in local cafés. “That’s where my interest started,” he says. He came back home and opened a café in Seoul’s artistic Hongdae district, a laid-back shop built in an old Korean home. The café is still going strong, frequented by an eclectic customer base including well-dressed business professionals and students seeking a trendy study spot. Choi’s Itaewon location was his way of trying something new, adjusted to fit the upper-class shops and Starbucks Reserve sharing the street. 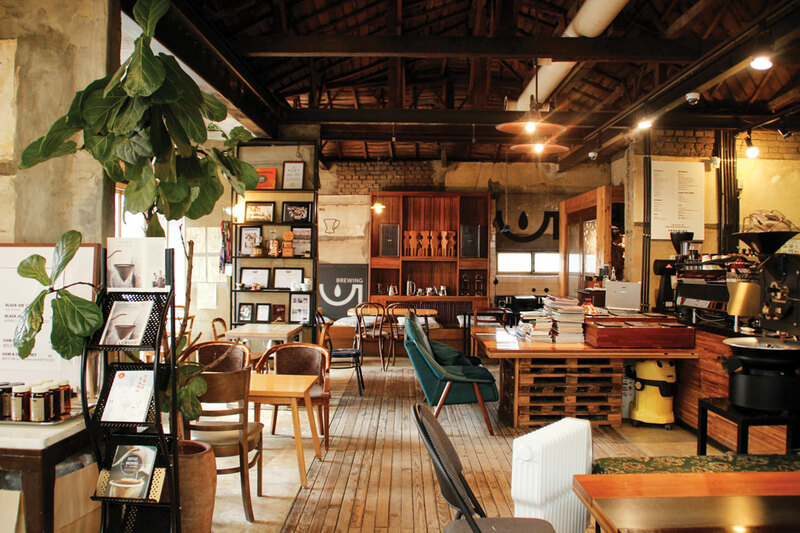 Eclectic furniture and warm wood tones give 5 Extracts’ Hongdae district location a homey feel. Now after multiple awards and two cafés, he’s happy brewing what he likes, and hopes his customers feel as passionately as he does. “It’s not my style to enter a contest every year. 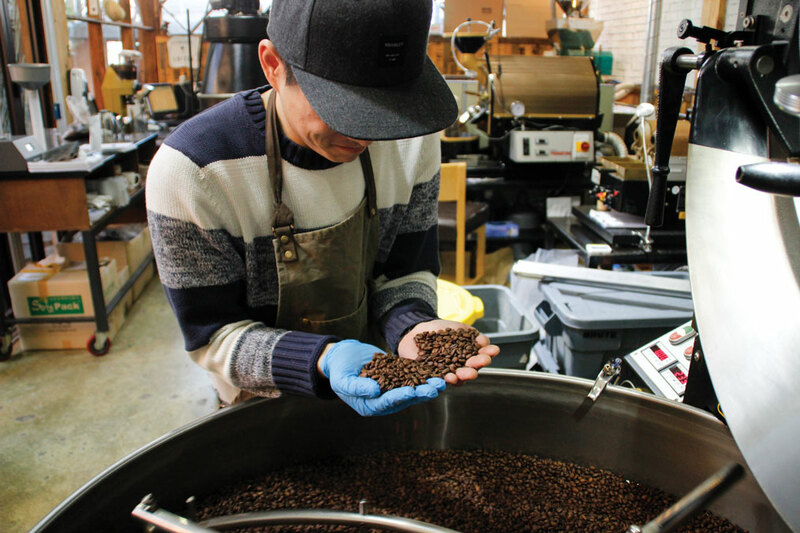 I’d rather wait until I find a great bean I want to introduce,” Choi says. He gushes about flavor and complexity, determined to extract all five flavors—or 5 Extracts—from every bean he roasts: sweetness, acidity, body, bitterness, and aromas. “Balance is the most important thing,” he explains. Though Choi launched his coffee career in Australia, Koreans can now access world-class coffee education in their home cities. 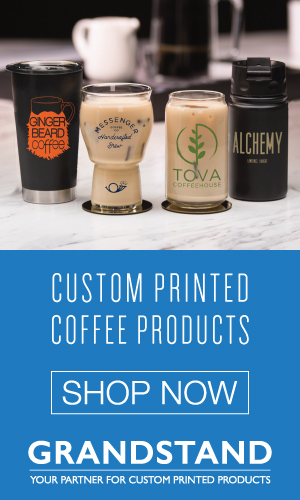 Academies across the country teach cupping, roasting, and proper milk-pouring techniques. 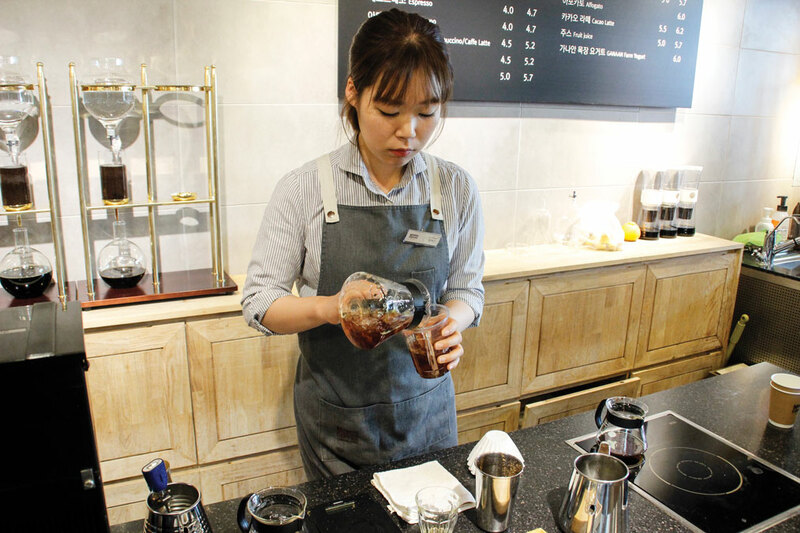 For some of Korea’s youth, facing the burden of grueling educational schedules and daunting competition for entry into good schools, the dream of becoming a barista has replaced that of doctor or teacher. For others, it’s become a viable second career option. 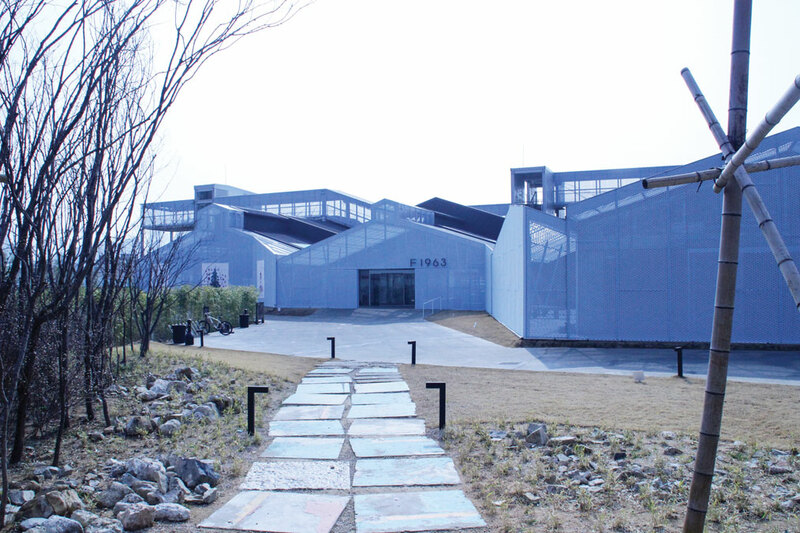 Haksan draws on local character to design each of its Terarosa cafés. When Yongdeok Kim first dove into the coffee business fifteen years ago, he hardly knew a thing about beans. Now he runs a $17 million business with a focus on specialty coffee, called Haksan roasting company. Kim started the roastery in 2002 at age forty, after spending twenty-one years as a bank branch manager. Operating out of Korea’s quiet and mountainous Gangwon-do province, Haksan distributed beans to hotels, upscale restaurants, and gourmet coffee shops. Then in 2012, after word of their superior roasting spread, they opened Terarosa, their first café. Haksan now has eleven Terarosa café locations across the country, with plans to expand into China. Terarosa has eleven cafés across Korea and plans to open a shop in China. At first glance, the baristas at Terarosa look like those at any other Korean chain: gray berets, identical aprons, name tags. 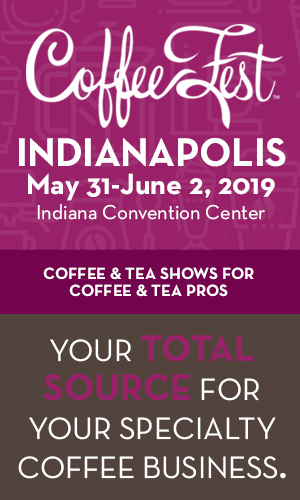 But peek over the counter, and you’ll see baristas with a deep knowledge of their beans and acute attention to detail, timing their blooms with steady hands for a long line of customers. His reference to the premium fashion brand as a benchmark is admirable, and at this point, Terarosa seems to be right on track. The interiors of their eleven cafés all have a similar feel, with rustic furniture and concrete floors a common theme. But there’s a uniqueness to each location that draws on the local character. “Each café we open has its own concept. The culture is the same, but they all express it in a different way,” Yongdeok says. Their Busan location is a perfect example of this, reflecting the city’s local character in their design. Korea’s city by the sea, Busan is the country’s second-most populous city and home to the world’s fifth-largest shipping port (by cargo tonnage). 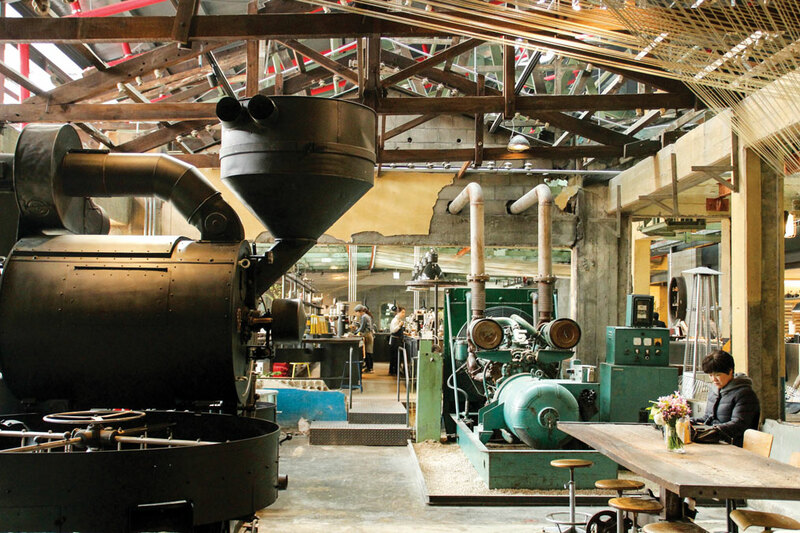 Terarosa captured the city’s industrial history by purchasing space in an abandoned steel warehouse and transforming it into a sprawling café, decorated with retired machinery from its steel-making past. Touring the trendy coffee stops in Seoul, there’s cause to believe it isn’t just the coffee, but cafés themselves that are driving Korea’s coffee craze. Home brewing hasn’t seen nearly the same growth spike as coffee shops. In a space-starved country, these wide-open, professionally-designed cafés have become indispensable social centers; a place for first dates, anniversaries, and birthdays. Cafés like Terarosa represent a changing landscape where design and quality are equally important. The shop’s industrial interior is a haven for die-hard Instagrammers, but Terarosa has also built a reputation on quality. A barista prepares coffee for eager Momos customers. As Terarosa looks to expand even further, eyeing markets in China and the Middle East, they’re counting on quality to set them apart. 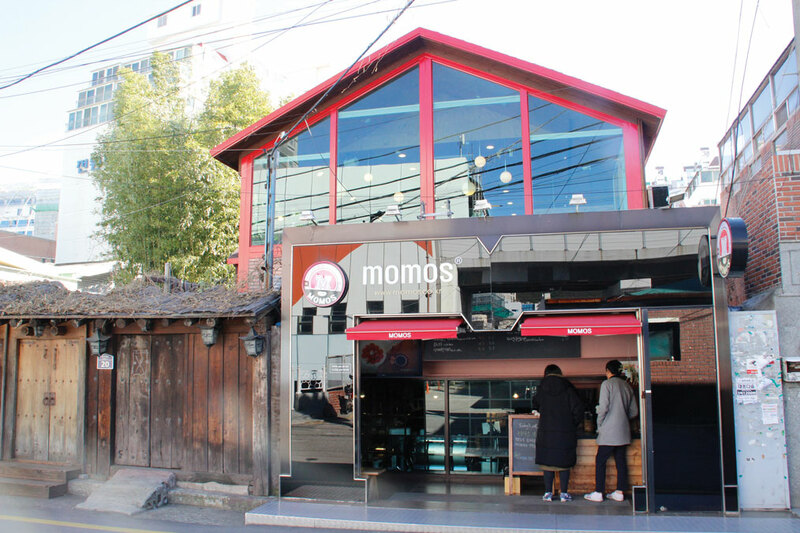 Another Busan staple, Momos Coffee, also looks to quality to build loyalty with customers. The city’s poster child for gourmet, ethically sourced coffee, Momos first opened in 2007 as a take-out booth on a quiet uptown street. “Now we’ve got two full floors, a bakery, a roastery, and a coffee academy,” says Hyun-ki Lee, owner and founder of Momos. He leaves out the two balconies, take-out window, and statue-filled bamboo garden. With its natural hardwood and traditional Korean roof, you could almost confuse Momos for a temple. Then you spot the constant flow of people carrying take-out cups and bags filled with baked goods. “These days our café gets around 1,000 guests a day,” Lee says. 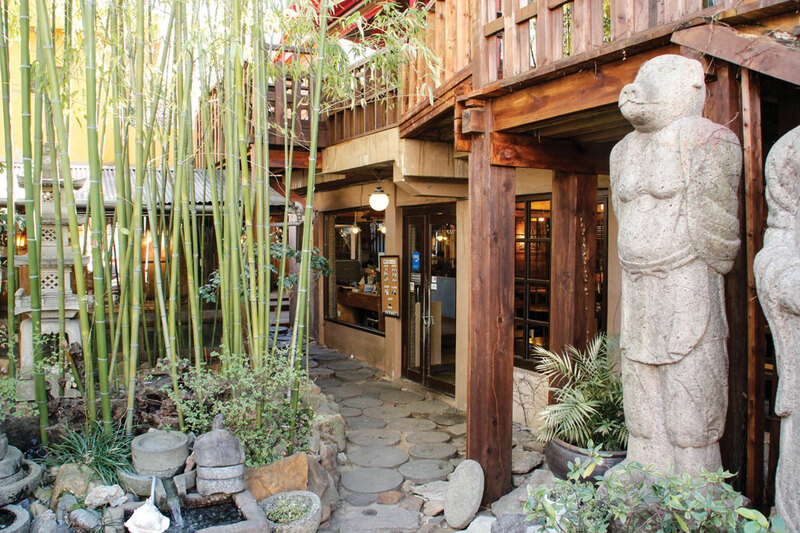 Momos statue garden welcomes guests to the coastal café. 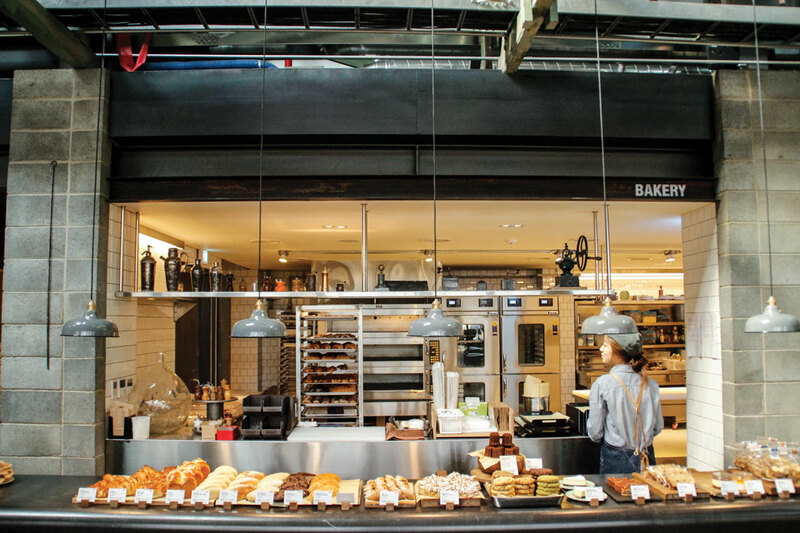 The roastery and bakery are both housed in their own temple-esque buildings, with glass walls on each to showcase bakers kneading dough or the roasters obsessing over their beans. There’s no question that atmosphere is part of the reason for Momos popularity, but they’re also serious about quality. 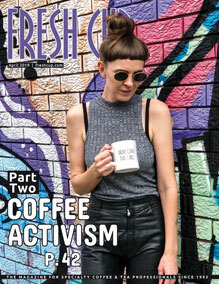 He’s been a barista and café owner through the Korean coffee market’s biggest changes, watching Korea transform from a country of primarily instant coffee consumers, through a market dominated by franchises, to a population thirsty for quality coffee with baristas who know how to find it. Lee first started training in 2008 in neighboring Japan, a country respected by Korean baristas for its comparatively long history with specialty coffee. In 2009 he traveled to the United States, where he earned his Q Grader and SCAA Cupping Judge certificate. According to Lee, this is where he learned about coffee marketing, forming the basis for a business back in Korea. “I also learned a lot about consumerism and coffee production areas. Even now I still visit the farms we trade with every year,” he says. Lee is invested in coffee’s future, and is looking to build a community from farmer to customer. You can see that long-term focus at work inside the café. The staff at Momos is upbeat and on top of their game. Everyone from the bakery to the front counter shares Lee’s passion for the café, an energy palpable from the moment you walk in the door. Momos’ take-out window caters to customers who are in a hurry. When I ask Lee about his plans for the future, he says major expansion isn’t his vision for Momos. All this talk with Lee about coffee makes me thirsty, so I order a cup of the Costa Rican coffee. I walk through a crowd of excited coffee drinkers in their element. It’s busy, and seats are scarce, so I take my coffee outside to the garden. 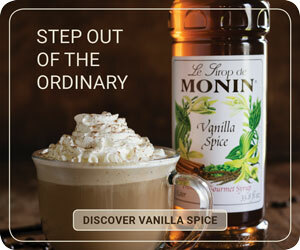 A natural flavor in a natural setting—a fitting end to this coffee journey down the peninsula. Coffee’s journey through Korea has been swift, but with cafés like Momos, it has reached a place where taste, service, and sustainability are held at high value. 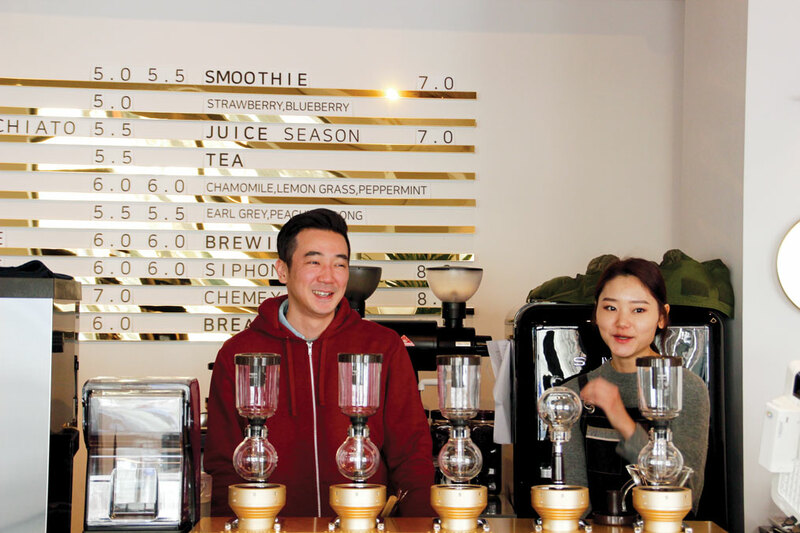 Rapid growth has inspired a new generation of Koreans who are passionate about their work, take quality and customer service seriously, and are leading the charge for the continued transformation of the country’s coffee culture. —Josh Doyle is a writer living in East Asia.